The balconies in each of these condos in North Myrtle Beach are furnished so you can relax in comfort. Watch the Atlantic Ocean from your ocean view balcony. Sip a cup of hot coffee and enjoy watching the sunlight shimmer atop the ocean waves. These luxurious North Myrtle Beach rentals are filled with amazing amenities. From the washing machine and clothes dryer to the numerous televisions that are accompanied by numerous DVD players, living in these North Myrtle Beach rentals for your North Myrtle Beach vacation is a dream! 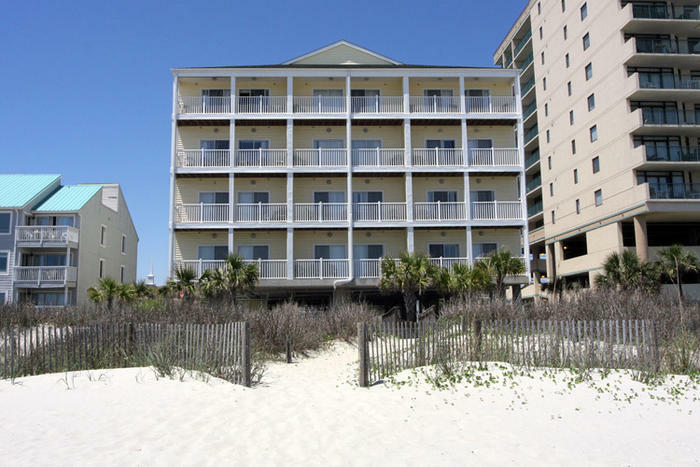 You will also find high-speed Internet access available at this North Myrtle Beach resort. Some of the North Myrtle Beach vacation rentals at Ambassador Villas feature a game room with a pool table. The kitchen in these North Myrtle Beach rentals come with full-size appliances, cookware, dishes and utensils so you can cook a meal if you so choose during your North Myrtle Beach vacation. This North Myrtle Beach resort is in the Ocean Drive section of North Myrtle Beach, South Carolina. That makes it a North Myrtle Beach resort that is closely located to water slides, amusement rides and more than 100 golf courses. It is easy to find this North Myrtle Beach resort from Highway 17 because it is located between 5th Avenue South and 6th Avenue South and both of these avenues lead from Highway 17 to the Atlantic Ocean. Your family will be within just a few blocks of Main Street where you will find nostalgia on every corner. Beach clubs feature live beach music and beckon shag dancers to hit the dance floors. Charming cafes offer delicious lunches and dinners and shops on Main Street encourage you to come in and look around for that special something that will forever remind you of your North Myrtle Beach vacation at Ambassador Villas. These luxurious North Myrtle Beach vacation rentals are down the street from Barefoot Landing, an attraction that is popular with locals and visitors alike. Barefoot Landing is located on the Intracoastal Waterway and boasts shopping, dining, attractions, Alabama Theatre and House of Blues. Check the events calendars for concerts and shows that appeal to your family. Also nearby is the Cherry Grove Fishing Pier where record catches have been made. Novice and experienced fishermen are invited to cast a line into the Atlantic Ocean and see what they are able to reel in. Spend one of your North Myrtle Beach vacation days fishing from this pier and not only will you enjoy a beautiful coastline, you just might return to Ambassador Villas with enough fish for dinner. Water sports near this North Myrtle Beach resort are plentiful. Go parasailing where you will fly high in the sky as a speed boat pulls you down the shoreline. Take the whole family on a banana boat ride and jump the waves while being towed by a jet ski. Rent Sea Doos and have an adventurous time on the Atlantic Ocean or on the Intracoastal Waterway. Deep sea fishing charters can help you hook the fish of your dreams and kayak rentals give you the opportunity to quietly explore the nearby salt marsh that is teeming with birds and fish. Boat rentals, boat tours and dolphin watch cruises are also available near the North Myrtle Beach resort of Ambassador Villas. There are more than 100 fantastic golf courses in the Myrtle Beach area. Many are award-winning, nationally recognized golf courses. There are par-3 golf courses, lighted golf courses, championship golf courses and 27-hole golf courses throughout Myrtle Beach and North Myrtle Beach, South Carolina. Driving ranges allow you to warm up and private lessons conducted by a golf professional are quite prevalent in the Myrtle Beach area. So pack your golf clubs and make your tee times. Dining in North Myrtle Beach, SC can be considered art because of the incredible Southern cuisine, Lowcountry fare and soul food you will find on hand. Be daring and order a dozen raw oysters or stick to the fried shrimp platters that everyone loves. Blue crabs, grouper and flounder are local to the area and menu items that include this delicious seafood are simply divine. There are more than 1,500 restaurants in Myrtle Beach and North Myrtle Beach, South Carolina.